Buzz around A Quiet Place 2 is getting louder. Speaking with Entertainment Weekly during the 2018 SCAD Savannah Film Festival, A Quiet Place co-writer, director, and star John Krasinski and actress Emily Blunt (Krasinski's real-life wife) opened up about potential storylines and plot details the highly anticipated sci-fi horror sequel. The pair, who portray married couple Lee and Evelyn Abbott in the film, discussed how the follow-up to A Quiet Place might further explore the Abbott family, the post-apocalyptic world in which they live, and the people-eating aliens they've faced off against more than a few times. For Blunt's part, she admitted that she thinks a prequel-sequel could be interesting, but feels that A Quiet Place 2 will focus more on the future rather than the past. "In some ways, the idea of seeing who these people were before this all happened would be interesting, but I'm not quite sure because I think actually it's now what's the next chapter and what happens next," Blunt said. "I think people feel very invested in this family … I think it's such an open book right now, and certainly for John who is lasering into something as we speak." Krasinski actually "didn't want anything to do with the sequel" after the astounding success of the original, signaling that he would neither act in A Quiet Place 2 nor work on the story or get behind the camera and direct. However, when the creative was struck by a "very small idea" that turned into something bigger, he couldn't help but commit himself to the sequel. "This is a world you can play in, this isn't just a character to remake … it's actually a world, which is a whole different, very unique experience," said Krasinski. "It's not like Alien or Jaws where the main villain is the thing you're repeating; it's an actual entire set of rules and the circumstance that the world has undergone that you can play in very different facets." So, which direction might the second A Quiet Place film travel (very, very quietly) down? It's tough to say, but as Krasinski mentioned, there's an entire world outside the Abbott family that can be traversed. Like the original film's star Millicent Simmons, who plays Krasinski and Blunt's on-screen daughter Regan Abbott, suggested, perhaps A Quiet Place 2 will explain the origins of the fearsome aliens, or center on another family "working on the same problems," or even jump ahead a few years and follow the Abbott children in a world where the aliens no longer run wild. In any case, viewers are in for a treat with the sequel. Krasinski is on board as screenwriter and producer (we're still awaiting confirmation that he'll direct) — and if what he did with the first film is any indication of his creative talents, A Quiet Place 2 is bound to be frighteningly fantastic. 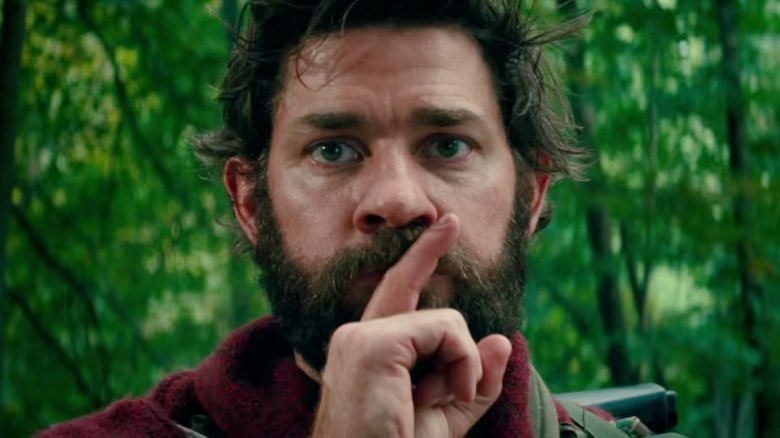 Find out what will go down in A Quiet Place 2 when the film opens in theaters on May 15, 2020.